I intend to become a serious tech blogger from now on. [Oh yeah, it's something we that hold day jobs and family (wife & kid) to boot promise ourselves daily :)] I ran into Assembly.GetCallingAssembly() while working on a larger problem [which again I hope to blog in a series of posts succeeding this one]. Fireup your notepad, copy/paste or type (oh, look out for Tenosynovitis) the below code. 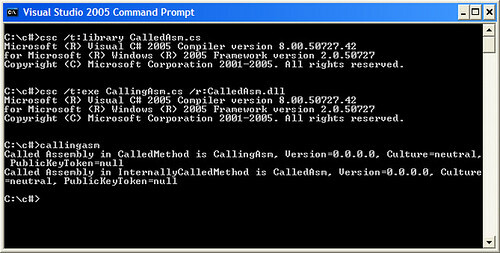 Oops... CallingAsm in CalledMethod() is okay. But even in InternallyCalledMethod()? The answer is inlining... C# compiler is inlining InternallyCalledMethod! So, I trust GetCallingAssembly() to work only in frontline methods i.e. methods I know that would only be called from a different assembly. For example, a public method on my framework class that I do NOT call internally.